Mendocino County artist Ernest Posey will present an exhibition of recent found object assemblage and selected works on paper at the Quicksilver Mine Co. in Forestville beginning on December 2nd. This Show continues through January 8th. "My own method is to find peculiar 'orphan' objects and give them a home. Mostly I prefer things which have already been worked on by human hands, and thus have a kind of subtle magic I call "mojo," a term the Voodoo folk in New Orleans use. It’s a good word signifying a kind of spiritual 'juice'," says Posey. "There is a mystery to these abandoned/lost/scattered things already shaped by human lives, still containing some quality of their makers." Born in New Orleans in 1937, Posey has presented more than twenty solo exhibitions of both his paintings and mixed media works, including shows at San Francisco’s Palace of the Legion of Honor, the San Jose Museum of Art, and numerous private galleries. He has also participated in many group exhibitions, including shows at the National Collection of Fine Arts, the San Francisco Museum of Modern Art, the National Institute of Arts and Letters, and the Santa Barbara Museum of Art. 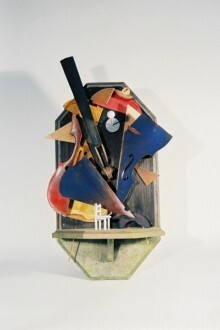 Now retired, Posey taught at the California College of Arts and Crafts, and at the San Francisco Academy of Art (where he was also Chairman of the Department of Fine Arts). He has also been a public television director, filmmaker, graphic designer, and gallery director. An Artist Reception for Posey will be held on Saturday, December 3rd from 4—6 p.m.
"Silk Butterflies attempt to mate on a castle in Verona. 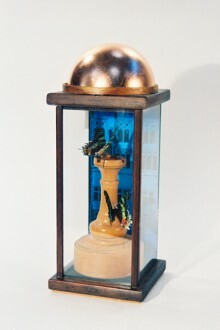 The oversize rook was part of a fragmentary chess set purchased years ago, and the decoupage background is a tinted photocopy of an Italian Renaissance façade. The flat top of the display case was so boring that I decided to top it off with a dome of copper leaf." "Twenty years ago I rescued a decrepit, beyond-repair violin at the Marin City Flea Market for $5.00. I schlepped her around for two decades. Finally, a couple of months ago I took her to the bandsaw and cut her into five pieces. I tinted the parts with transparent colored inks and reassembled them on a miniature stage. The tiny chair is the audience, waiting for the violin to begin playing a ghostly scherzo. The chair is empty because the audience is a ghost also."